TOKYO — Those who know President Trump best have always said he knows how to read a room. His radar must've been a little off on Monday, though, during a joint news conference with Japanese Prime Minister Shinzo Abe. Trump's obvious cheer from the day before was gone and he seemed tired as he faced the press for the first time during his Asia trip. Though he kept up his characteristic ad-libs, Trump lacked the tonal sharpness he wields when he knows he's really nailing a point. On Monday he delivered the message he set out to communicate, but with noticeably less of his showman's flourish. Not that any of us could blame him. Between the hectic schedule and the time difference most of the reporters were struggling. I woke up at 2:00 a.m. Tokyo-time and, as any insomniac millennial would do, started posting pictures on Instagram. The fatigue factor will be huge here. Asia trip veterans warned me of that early on, but it's easy to forget how truly awful the exhaustion feels. Most important on this trip: How will that manifest itself during the 11 days overseas with stops in five countries in a president already prone to outlandish statements? During his opening remarks, Trump painted a picture of two allies side by side, in agreement on pressuring North Korea to denuclearize and working toward mutually beneficial trade agreements. Platitudes, but positive platitudes no less. The president praised Japan's "vibrant" cities and "powerful" economy — until he made a U-turn. 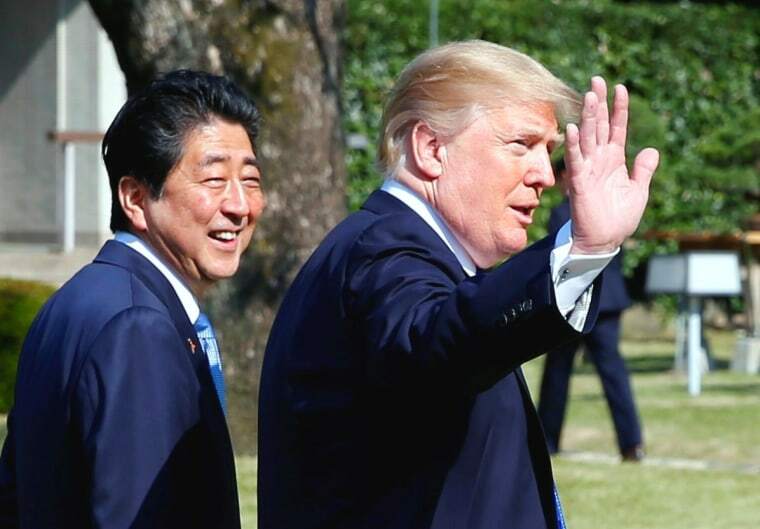 "I don't know if it's as good as ours," Trump interjected, referring to the Japanese economy and turning to face Abe at the lectern next to him. "I think not. OK?" The Japanese prime minister merely nodded, chastened. It was a typically Trumpian moment — a half-joking, spontaneous reminder of who's in charge and that America is, well, first. Japan could be second, Trump offered, capping off the joke but no one was really laughing.